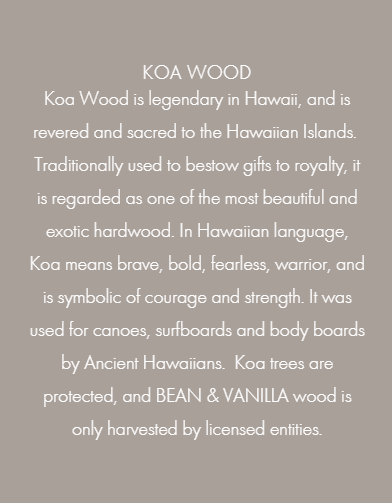 "A navigator that follows the stars; A hero looking for his mermaid love"
KOA is a rare wood found only in the Hawaii Islands, where it is considered sacred. A live Koa tree is illegal as it is a protected species and only dead or decayed trees can be sold to license holders. All Bean & Vanilla Koa wood comes from legal sources. This is the only way to use this wood here locally. 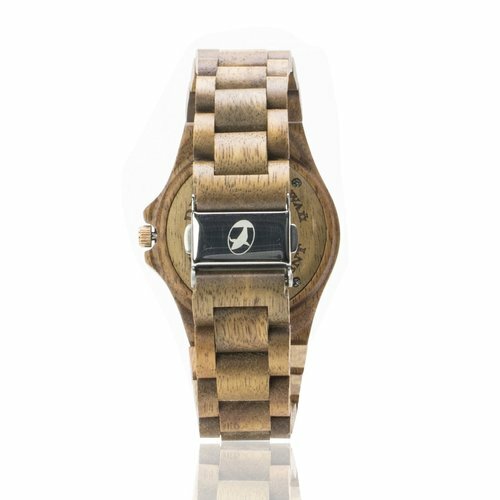 This sustainably harvested, 100% natural Koa Wood Watch is sweat and splash resistant. Hawaiian petroglyphs line the watch face, symbolizing protection, strength, and safe journey. Light-weight wood is combined with a logo-stamped stainless steel push-button deployment clasp. Watch glass is made of scratch-resistant, non-glare Crystal Sapphire. Date and day is displayed on dial. Wood is artificial & toxin free, hypoallergenic, and sustainably sourced. Box and cushion watch holder are included. Watch comes with One Year Manufacturer Warranty. Watch uses Citizen Movement. Makau (Hawaiian for Fish Hook): Fish hooks were essential in ancient Hawaiian culture, as sea creatures were a large part of the ancient Hawaiian diet. The makau symbolizes prosperity, luck, and “everything good”. BEAN & VANILLA wood watch offers only the finest quality wood watch can offer and only use SAPPHIRE CRYSTAL (found only in LUXURY watches) in all of our designs. We design and create inspirational, functional and transcendent of time pieces. We build quality products that inspire people back to nature because we believe that Nature isn’t just out there, but a part of You! Our premium hardwoods crafted with only sapphire crystal window dial and citizen movement - gets better over time and can be passed down to the next generation. We only use the finest quality to give you the superior value you deserve. We take pride and stand behind each of our product with confidence. Our wood watch is light weight perfect for everyday wear without feeling dragged. 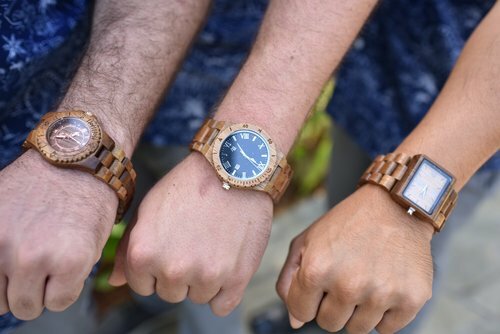 They work perfectly as wood watch for men and wood watch for women. The wood grains are so beautiful and give different character and uniqueness to every watch. Our watch glass are made with Crystal Sapphire which makes the glass scratch resistance and non-glare. The Date is also displayed on the dial. 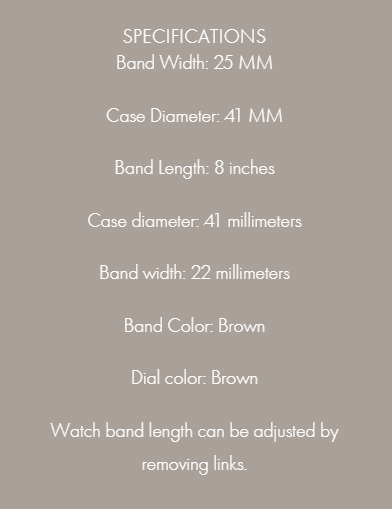 Our wood watch band are hypoallergenic and made with all natural wood. Unlike other cheap watches out there, our wood watches uses Citizen movement which you can rely on and last you for a very long time. Our watch is uniquely designed that fits your unique personality and allows you to stand out and make a lasting impression from a crowd.